Locally, the job market is as competitive as ever with a 2014 article from Crain’s Cleveland Business describing several real life scenarios from Northeast Ohio tech companies involving “super crazy demand” for highly specialized skills within IT, recruitment of passive candidates away from gainful employment, and a focus on creating workplace cultures to lure top talent into new companies, just to name a few. While the subjective influences that may be at play in this seemingly chaotic battle for top tech talent are a bit more amorphous and take time to develop (i.e. creating an appealing brand or organizational culture) there are also key objective facts that can be identified as likely contributors to the competitive and complex nature of the IT job market. With an average national job growth rate of 10.8%, the Bureau of Labor Statistics (BLS) is projecting a nearly 8% higher job growth rate for Mathematics & Computer related occupations for the time period from 2012 to 2022. The projections are even slightly more lopsided regionally, with the Cleveland-Elyria-Mentor Metropolitan Statistical Area (MSA) projecting an 18.4% Mathematics & Computer job growth rate as compared to the 9.5% overall job growth rate from 2010 to 2020. This job growth reflects the increasing demand for highly skilled employees to support, develop, mange and conduct research for the computer technologies that have become an integral part of nearly every organization, regardless of whether or not the organization has experience recruiting and retaining IT staff in the past. 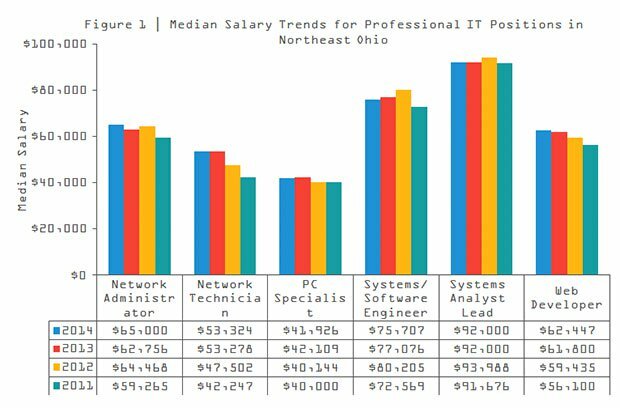 The figure below provides a snapshot into the IT salary growth seen in the Northeast Ohio region from 2011 to 2014 for several key job titles from the annual ERC Salary Survey. Although there has been slight increases in the median salary for each of the job titles over the time period represented, the growth is neither consistent, nor at levels that one might expect to see for such a high demand industry. This slow growth could be somewhat more complex, involving generational shifts, new hire, etc, but it certainly does raise concerns that moving ahead local organizations may struggle to fill these positions with top talent if salaries do not improve in Northeast Ohio. The vast majority of IT positions require a minimum of a Bachelor’s Degree and in fact, the starting salary for a Bachelor’s Degree in Information Technologies or Computer Science typically come in within the top one or two starting salaries reported in the 2014 Intern & Recent Grad Pay Rates & Practices Survey. Perhaps even more striking for these highly technical, skill specific starting positions, is that even an Associate’s Degree in IT can out-pay the starting salaries for other recent graduates with Bachelor’s Degrees, but in less technical fields, such as Business Administration or Marketing. Even once an employee is hired on, the highly technical nature of IT work requires an employer to offer ongoing training and development in order to retain a successful employee. Ultimately, it appears that the universal need for IT related services makes attracting and retaining top talent infinitely more challenging than for other highly technical, industry specialized positions that may only exist within one sub-set of the workforce. 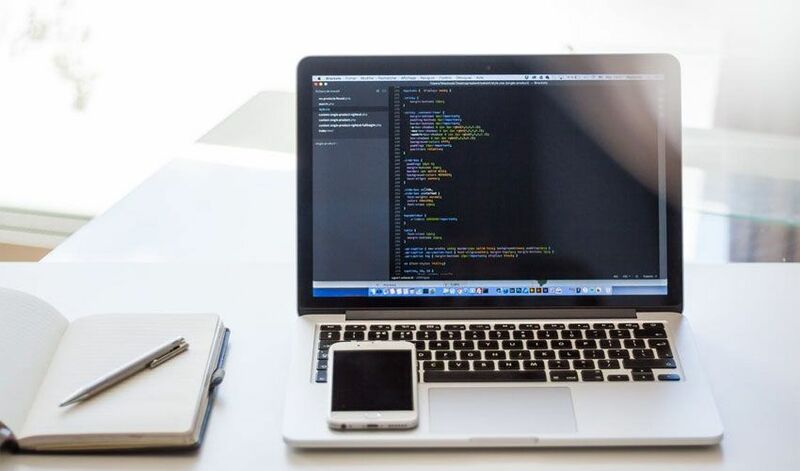 Although the Crain’s article focuses primarily on organizations in the industry of information technology, the IT function has, like an HR or finance department, become a requirement across industries. The importance of computer technologies for daily business operations means that demand in the field will only continue to grow and requires that now more than ever, employers offer the whole package from salary to culture to training in order to successfully attract and retain IT top talent.